PTSG were employed to provide all the bespoke access systems on the Mackie Ramsey Taylor Architects’ Emergency Care Centre (ECC) project for NHS Grampian. This ECC replaces the existing A&E department on the hospital’s Foresterhill campus, thus providing flexibility for a re-designed emergency care pathway between community health partnership and the acute hospital. 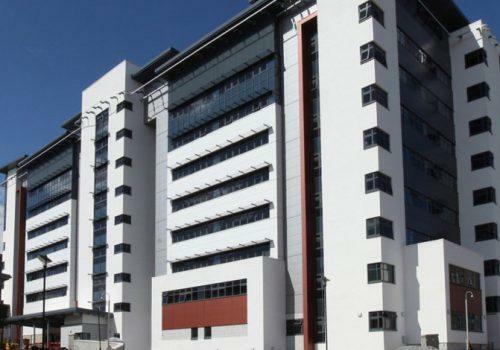 The 10 storey building was furnished with 3 separate systems, each comprising of a single suspension rail fixed to the building, complete with a powered cradle unit on each of the systems. Each system has been designed with the cradle being able to be parked away in its own locked gated parking bay.